ELORA, ON — A total of seven elimination dashes on July 30 decided the finalists for Grand River Raceway’s feature races on its 28th Industry Day event (August 6 at 12:30). From three divisions of the nation’s best freshman colts, nine have advanced to this Monday’s $262,000 final of the Battle of Waterloo. Leaving from post number six will be Bettors Wish, a Bettors Delight colt who not only won his elimination, but demolished the current Canadian season record for two-year-old pacing colts on a half-mile track, winning in 1:54.3. Having already tripled his yearling price of $20,000, trainer Chantal Mitchell will seek her first Battle victory. If Bettors Wish was able to succeed in next week’s final, Mitchell would also be the first female trainer to hold victory of the Battle Of Waterloo. Winning his elimination dash by a head, Bettors Wish was able to fend off a closing Sports Teen who will leave from post four for trainer Paul Reid, also seeking his first Battle Of Waterloo win. The Battle of Waterloo Final will also see Bronx Seelster, the maritime invader who has been ultra-impressive since moving west. Trainer Wayne McGean will send out the Big Jim colt from post nine as McGean seeks his first Battle of Waterloo victory. Bronx Seelster was missionized early by driver Trevor Henry from post seven while the tandem posted fractions of 27.2, 58.1, 1:27.1 for a mile time of 1:55.1 in a length and a quarter victory over Wager On Me who also advances to the final for the father-son duo of Jody and Carl Jamieson and will leave from post three. Heading into the final as the richest horse in the field with $94,000 banked in five starts, Bronx Seelster will have to overcome the trailing position as he starts behind Prestige Seelster (Post 1) who was second in his elimination to Blake MacIntosh trainee Better Moonon Over. MacIntosh, who won the Battle of Waterloo in 2016 with Sports Column, will look to build on a career year as he preps three colts for the final. Better Moonon Over (Post 7 in the final) won his elimination in 1:55.1 for driver Chris Christoforou who also guided MacIntosh’s 2016 winner. MacIntosh will also send out Da Delightful (Post 5) and Fast N First (Post 8). Through four eliminations, 33 fillies had to finish no worse than second in order to be guaranteed a spot in the $163,840 final. Trainer Dave Menary will send out two fillies, both winners of their elimination divisions, as he chases his third Battle of the Belles title. 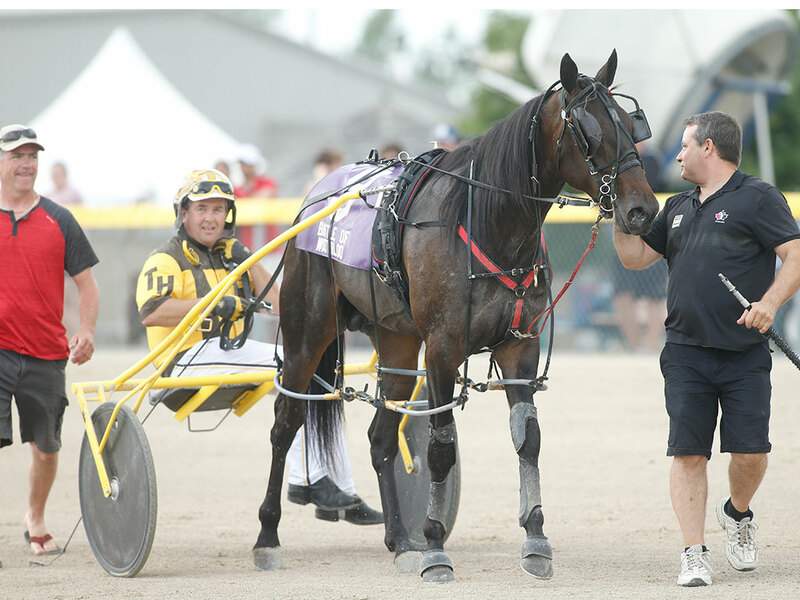 Ideation Hanover, a Bettors Delight filly who was purchased for $50,000 as a yearling, lowered the current Canadian record for two-year-old fillies on a half-mile track when she won by four lengths in 1:55. She draws post five in the final. Menary will also send out Quebec Blue Chip. The Sportswriter filly was a $40,000 yearling. She won her elimination race by five lengths in 1:55.4. Quebec Blue Chip will leave from post three in the final. Undefeated in her career thus far, Powerful Chris, will have to overcome post eight for trainer John Pentland. In the history of the Battle Of The Belles, no horse has ever won from post 8, however, Powerful Chris was able to conquer a tough first-up trip to win by a neck over Kylie Seelster who leaves from post two in the final for another father and son duo looking to score their second Battle Of The Belles title, Gregg and Doug McNair. Blake MacIntosh, who sends out three colts in the Battle Of Waterloo final, will also send forth Belles elimination winner Clearly Better, a Better Than Cheddar filly who took her elimination in 1:55.4 for driver Jonathan Drury. She will leave from Post 7 in the final. Post 9 will be the starting position of Village Joules, whose sister Village Janus won the Battle Of The Belles in 2010 for trainer Rod Therres, a co-owner in this filly. Below are the fields for the finals. Post time for #industryday28 on August 6 is 12:30 p.m. Festivities and the broadcast begin at 12:00 noon. Complete event details are available here.